A new lab inside RITâ€™s Golisano Institute for Sustainability, made possible by a $2 million gift from RIT alumnus and former trustee Sudhakar â€œBalâ€ Dixit, will provide innovative research and testing on fire-resistant materials and systems. A new lab inside Rochester Institute of Technology’s Golisano Institute for Sustainability (GIS), made possible by a $2 million gift from RIT alumnus and former trustee Sudhakar “Bal” Dixit, will provide innovative research and testing on fire-resistant materials and systems. The Bal Dixit Laboratory for Advanced Materials and Fire Protection Research is designed to perform industry testing, research and analysis on fire-resistant materials for product manufacturers or sellers of protective clothing, fabrics and coatings that require flammability, heat resistance, smoke composition and other advanced testing. The lab will work with companies seeking custom thermal testing and product development. 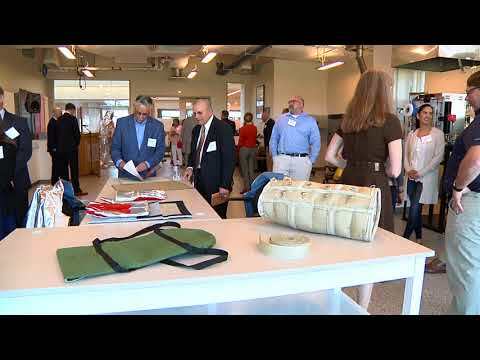 The new RIT lab was dedicated during a naming ceremony at 4 p.m. Monday, June 25. The ceremony featured remarks by RIT President David Munson; Nabil Nasr, associate provost and director of GIS; Dixit, chairman of the board of Newtex Industries; and Jerry Joliet, CEO of Newtex. Among its leading testing equipment, the Dixit Lab features a vertical flammability tester to measure the ignition-resistant properties of material; a smoke density chamber to evaluate the optical density and determine the composition of smoke given off under flame and non-flaming conditions; and a large test furnace that will determine the heat resistance and heat-transfer readiness of engineered systems. Dixit received his MBA from RIT’s Saunders College of Business in 1974—four years before he launched Newtex, where he created the industry’s first safe and commercially viable alternative to asbestos. The new RIT lab has been a longtime dream of the Katol, India, native. “As founder and CEO of Newtex, I encouraged and valued creativity and innovation, along with taking calculated risks,” Dixit said. “I believed in those days that the best way to stay ahead of the competition was to find new and better ways to solve problems. He noted that the lab also will have an educational component, teaching RIT students about research and testing best practices through co-ops and providing workforce training for the next-generation of workers in this important research area. After receiving his degree in textile technology from the University of Punjab in India, Dixit emigrated to the United States in 1964, joining Union Carbide Corporation as an advanced technologist. There, he helped develop carbon fiber for lightweight structural composites that were later incorporated into General Dynamics’ F-111B fighter aircraft. Dixit earned his master’s degree in textile technology from the University of Massachusetts in 1966, and soon after joined Garlock, where he was tasked with establishing what, at the time, was the most modern asbestos plant in the world in Sherbrooke, Quebec, Canada. Always striving to improve, Dixit went on to earn an MBA from RIT in 1974. In 1978, he left Garlock, launching his own company, Newtex, where he developed Zetex fiberglass fabric, an effective alternative to asbestos. In just five years, Newtex had grown to $2.4 million in sales. In recognition of Dixit’s forward-thinking and entrepreneurial leadership, the company was recognized as one of the Top 10 Small Businesses in the U.S., and in 1991, President George H.W. Bush presented Dixit with the Excellence in Exporting Award. Dixit led Newtex to become the only fully integrated provider of woven materials and fabric-based systems that protect from heat and fire—from proprietary glass yarn processing, in-house-weaving, coating and laminating to custom-designed and custom-sewn systems. In 1996, Dixit was appointed director of the Federal Reserve Bank by former Chairman Alan Greenspan and served as chairman of the board of the Buffalo branch of the Federal Reserve Bank for five years. Meanwhile, Newtex continued to grow, acquiring companies in Singapore and China. 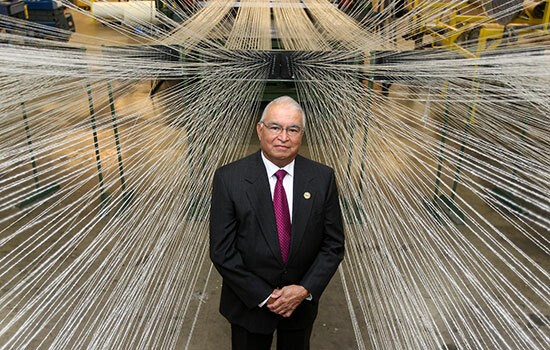 Dixit stepped down as president and CEO in 2006 but continues to serve as chairman of the board of Newtex Industries. He was inducted into the Rochester Business Hall of Fame in 2003. In addition to serving RIT as a trustee, he has been a member of the boards of Rochester General Hospital and the Greater Rochester Chamber of Commerce. Nasr noted that in addition to being dedicated to Dixit and those who will follow his spirit of discovery and take the industry to new heights, the lab now bearing his name will encourage important collaboration between industry and academia. “By working with experts across organizations, we believe we will be able to find solutions to the most pressing material challenges—both today and in the future,” Nasr said.